alaTest on kerännyt ja analysoinut 18 arvostelut tuotteelle GOJI GBTB14 Portable Bluetooth Wireless Speaker - Black. Keskimääräinen antama arvosana tälle tuotteelle on 3.7/5, verrattuna keskimääräiseen arvosanaan 4.1/5 kategoriassa Audiolaitteet. Me analysoimme käyttäjien ja ammattilaisten antamia arvosteluita, tuotteen ikää ja muita seikkoja. Verraten muihin tuotteisiin kategoriassa Audiolaitteet, GOJI GBTB14 Portable Bluetooth Wireless Speaker - Black on saanut alaScore™-arvosanan 88/100 = Erittäin hyvä. Short battery life but long charge. Battery failure after 1 day. Volume control stopped working on replacement after 3 days. Simple, easy to use and does the job. 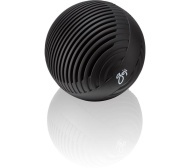 Worth buying, especially when there are speakers out there triple the price of this one! Love this speaker, I have had it connecting to my phone and amazon echo dot. I love it, it's fully portable, with a good distance range for Bluetooth and can be connected via wire without losing degradation. No real bad points, sometimes there can be interference when using Bluetooth. But hasn't happened often. Very compact and good looking. Doesn't pair with all Bluetooth equipment. Nice design, portable and great value. Connecting to Bluetooth is very simple. It vibrates and moves on hard surfaces!! Ultimately portable which is exactly what I was looking for (I take it when working away and it easily fits in my bag/luggage). Very simple to use and very good value for money too. No real bad points - clearly it's never going to be a Bose/Sonos/anything like that.